With their self-imposed deadline of having a bill complete by Monday night looming, members of the joint House/Senate Conference Committee on Jobs met on Monday afternoon at the Minnesota Senate Building to release their spreadsheet which contains the numbers related to their plan going forward. It was a mixed bag of good and bad news, with most key numbers reflecting a true compromise between the less favorable House position and the more favorable Senate position. View the full spreadsheet for more details. On Line 71 the Minnesota Investment Fund receives $24 million for the biennium. On Line 74 the Job Creation Fund receives $15 million for the biennium. On Line 156 the Border to Border Broadband Grant Program receives $15 million for the biennium. On Line 157 the Broadband Development Office receives $500,000 for the biennium. In passing the spreadsheet on Monday, conferees announced they will meet again later in the week to consider amendments to the bill before sending a final version back to the House and Senate floors for a vote. EDAM members are strongly encouraged to reach out to their elected in these last few weeks to support funding for these important initiatives. The first of two conference committee meetings last week featured testimony from several state agency heads, while the second meeting was brief and involved adopting of technical amendments. EDAM and representatives are continuing to talk with conferees about differences between the House and Senate positions on MIF, JCF, Redevelopment Funding and Broadband. House and Senate Republican leaders met with the press on Friday morning to announce their budget targets. With the constitutionally-mandated deadline for adjournment barely three weeks away now, we are rapidly approaching “crunch time” when a budget must be developed and passed into law to avoid a government shutdown. Among the highlights of the plan revealed by Speaker of the House Kurt Daudt (R-Crown) and Senate Majority Leader Paul Gazelka (R-Nisswa) were a total state budget of $44.8 billion, which does not including tax relief and $300 million in transportation funding which will come from the general fund. They noted that transportation, education, and tax relief are their top priorities. They have also set internal deadlines and expect to have final conference committee reports by Monday, May 1, which means that differences may be worked out over the weekend, and possibly behind closed doors. They hope to have overall targets to begin negotiations with Governor Dayton by Thursday, May 4. Definition of increment under five-year and pooling rules with an effective date that affects new certifications. Modifies reference to increments in percentage pooling rule to be consistent with the new changes. Includes an effective date that affects new certifications. The legislature has returned from its one-week break and resumed work to complete a two-year state budget by the constitutional deadline of Monday, May 22. This week, legislative leaders appointed their members to serve on conference committees to negotiate individual portions of the state budget, which must be in place by July 1, 2017 to avoid a government shutdown. In a letter to legislative leaders, Gov. Mark Dayton stated that he will not accept cuts to state agencies from the legislature unless they stipulate exactly what programs they would defund. State commissioners and conference committee chairs will meet throughout the process in an effort to ensure an acceptable outcome is reached for all three sides of the negotiations. You can view a spreadsheet that outlines the positions of the governor, House and Senate as they go into budget negotiations. When the legislature passes a bill it must be passed with identical language by both the House and Senate before it can go to the governor for signature or veto. If differences exist in the language between the House and Senate versions, a conference committee is created where each chamber receives equal membership, comprised of three to five members from each. For omnibus finance bills, membership is always five members per body. The conference committee will meet until the differences in position have been resolved and they return a conference committee report to their respective chambers. After a conference committee is established, House and Senate leaders each appoint a conference committee co-chair. The House and Senate co-chairs alternate holding the gavel for the committee meetings. The first meeting usually includes a walk-through of side-by-side bill comparisons by non-partisan research staff; they will highlight the differences between the House and Senate positions. Public testimony may be heard from interest groups as well as relevant provisions within the bills that may not have been included by the other body. Work then begins on resolving the two chambers’ positions. While the governor is not required to be involved in the conference committee process, they are usually involved in the negotiations taking place. Members of the governor’s administration are typically present at committee meetings to share insight into the governor’s position, information requested by legislators, and to provide expertise. State commissioners are often present as well to meet with the conference committee co-chairs and other legislators. Approval from the governor isn’t necessary on conference committee report, but they may decide to veto the bill once sent to their desk, so the position of the governor does influence the negotiations. The Jobs and Energy Affordability Conference Committee held its first meeting on Monday. Because it was the first meeting of the committee, they went through committee introduction, a walk-through of the side-by-side and spreadsheets. Following the walk-through the committee took agency testimony on provisions in their jurisdiction. Copies of the committee documents can be found here. Next the committee will adopt all same and similar language between the two versions of the bill. Following that, the hard work will start as the committee will have to work out their differences between the two positions. That list includes funding of MIF, JCF, Redevelopment Grants and Broadband. Minnesota Investment Fund (MIF) would receive $12.5 million in both FY 2018 and FY 2019. Job Creation Fund (JCF) would receive $8 million in both FY 2018 and FY 2019. Redevelopment Grant Program (RGF) would receive $1.5 million in both FY 2018 and FY 2019. Broadband Development Office would receive $250,000 each year (FY 18 and FY 19). Border-to-Border Broadband Program would receive $10,000,000 each year (FY 18 and FY19). Minnesota Investment Fund (MIF) would receive $12 million in FY 2018 and $11 million in FY 2019. Job Creation Fund (JCF) would receive $5 million in both FY 2018 and FY 2019. Redevelopment Grant Program (RDG) in not funded in the House bill. Border-to-Border Broadband Program would receive $7,000,000 for FY 18. The House also includes a number of policy provisions that would place a cap on the on the Broadband Development Office. This cap would limit the number of staff and their ability to administer the grant awards and would cut the mapping program. The Minnesota Legislature returns this week to begin their final push towards the end of session. The 90th Legislative Session constitutionally has to adjourn by Monday, May 22, 2017. That leaves just under five weeks for legislators and Governor Mark Dayton to reach compromises on a number of budget bills as they look to pass a state budget before adjournment. If they cannot pass their budget bills before the May 22 deadline, the legislature will have to look at a specials session to pass a budget and avoid a government shutdown come July 1. While five weeks might not seem like a lot of time, at the Capitol it can seem like an eternity. So what to do and how can we help? Last week, EDAM members received two updates calling for members to contact their legislators. If you have not taken those steps yet, we challenge you to take 5-10 minutes this week and reach out to them regarding the Minnesota Investment Fund, Job Creation Fund, Redevelopment Grant Fund and the Border-to-Border Grant Fund. These programs are critical to economic development, and the legislature needs to hear from EDAM members across the state. Let them know how you use these programs, what they have meant for your communities and why it is important to keep funding these programs and add new money to them. Over the next few weeks we will keep providing updates as bills move forward in the final weeks. We will also continue to ask for your help as we try to avoid any potential program cuts. Thank you in advance! $250,000 each year (FY 18 and FY 19) for the Broadband Development Office. $10,000,000 each year (FY 18 and FY19) for the Border-to-Border Broadband Program. No grant awarded under this program may fund more than 50 percent of the total cost of a project in an underserved area. Grants awarded for projects in unserved areas require a 35 percent match. Grants awarded to a single project under this section must not exceed $3,000,000. However, included in the bill is a policy change that allows that a local government entity may receive more than one award in a fiscal year. $7,000,000 for FY 18 for the Border-to-Border Broadband Program. Policy changes included in the House proposal would place a cap on the on the Broadband Development Office. This cap would limit the number of staff and their ability to administer the grant awards and would cut the mapping program. As an organization, EDAM has concerns with the funding levels in each bill, but is very concerned with the policy changes that the House proposal has laid out. To date, the Border-to-Border Broadband grant program has resulted in over $65 million in state grants over the past three years. These grants have leveraged over $81 million in matching dollars. If the policy language was to move forward, Minnesota could be losing or severely cutting a program that has been successful in expanding broadband across the state. HF 4, the House Omnibus bill chief authored by Rep. Greg Davids (R-Preston), contains numerous items that were included in the tax bill vetoed in 2016 by Gov. Mark Dayton due to a drafting error. With the bill being well over 400 pages long, it also includes tax provisions linked to funding roads and bridges contained in the House Transportation omnibus bill, including $450 million in reprioritized General Fund vehicle-related fees and taxes. The House Omnibus Tax Bill includes over $300 million in recommendations from the House Property -Tax and Local Government Finance Division, but does not include increases to Local Government Aid, County Program Aid or working family tax credit. The Senate Tax Omnibus bill SF 2255, chief authored by Sen. Roger Chamberlain (R-Lino Lakes), proposes $900 million in tax relief focused mainly on individual taxes, rural Minnesota and business owners. The bill also increases the working family credit, encourages online filing and conforms to the federal government level of estate tax. As mentioned yesterday, now is the time to call your legislators. As the conference committees, leadership and the Governor begin to negotiate these bills, many dollars will be shifted around to fall within an agreed upon budget. We need legislators to know about the importance of funding the Border-to-Border Broadband Program and that there are many important pieces in the tax bill that drive economic development across the state. Please take five minutes to shoot a quick email or leave a phone message. To find out who your legislators are or to locate their contact information, please click here. We also ask that you contact Senate and House Leaders. With the passage of the third committee deadline at midnight of Friday, March 31, the legislature is coming to the final stretch of session, where most action will take place on the House and Senate floors, with little work taking place in the committee rooms. This past week saw both chambers meeting on the floor every day of the week passing major finance and appropriation (omnibus) bills. Finance Committees in both the House and the Senate have been in a flurry of activity, holding meetings all day to hear testimony on the hundreds of proposals included in the bills. The passing of committee deadlines means that committees will not take formal action on any bills for the remainder of the session (excluding the Senate Finance Committee and the House Ways and Means Committee). Every finance committee compiles an omnibus bill. What follows is a detailed description of the House and Senate jobs, taxes and transportation omnibus bills. As noted last week, the House and Senate Jobs Committees have been constructing their omnibus bills over the last few weeks. SF 1937, chief authored by Sen. Jeremy Miller (R-Winona), was introduced two weeks ago and was passed off the Senate floor last week Wednesday. The bill passed with bipartisan support on a 58-9 vote. Provisions in the Senate bill include: the Minnesota Investment Fund (MIF) receiving $12.5 million in both FY 2018 and FY 2019 and the Job Creation Fund (JCF) receiving $8 million per year. Also included in the bill is an appropriation of $1.5 million to the Redevelopment Grant Program. The Senate proposal also has provisions allowing for flexibility between the programs. Sen. Miller’s bill allows for $2 million that could be moved between MIF and JCF accounts by the Department of Employment & Economic Development to meet business demand. The language adjusts the qualifying thresholds to be an eligible JCF business. They are lowered for projects in greater Minnesota or for businesses with majority ownership by women, veterans, minorities or persons with a disability. In the House, HF 2209 received two hearings last week with one hearing for public testimony and the other for members to amend the bill. The House Jobs Committee passed the bill of committee on a party line vote and sent the bill to the Ways and Means Committee. On Monday night the bill was sent to the House floor and will most likely get heard on Thursday, April 6. Under Rep. Pat Garofalo’s (R-Farmington) bill, MIF would receive $12 million in FY 2018 and $11 million in FY 2019. The JCF would receive $5 million in each year. No funding for the Redevelopment Grant Program was included in the bill. Like the Senate bill, there was some policy language that was included. JCF policy changes outlined in the bill would put restrictions on the JCF by limiting awards to counties where the average unemployment rate for the prior 12 months is equal to or greater than the state average unemployment rate for the same 12 months. This would eliminate communities from 31 Minnesota counties from accessing JCF funds. Both bills include funding for the Border-to-Border Broadband Grant program. Under the Senate bill, the program is funded at $10.25 million for both FY 2018 and FY 2019. The House proposal funds the program for FY 2018 $7 million. In the House, we are expecting to see a number of amendments offered that look to increase funding to MIF, JCF, RDG and Broadband. There will also most likely be an amendment that would remove the language that would not allow 31 counties to access JCF Funds. Once the House acts on the bill, EDAM will be sending out an update to members asking them to contact legislators in regards to the two bills as they will be going to conference committee. We will need everyone’s help in the last six weeks of session. On Thursday of last week, the House passed their Tax omnibus bill, HF 4, off the floor. Chief authored by Rep. Greg Davids (R-Preston), the bill contains numerous items that were included in the tax bill vetoed in 2016 by Gov. Mark Dayton due to a drafting error. With the bill being well over 400 pages long, it also includes tax provisions linked to funding roads and bridges contained in the House Transportation omnibus bill including $450 million in reprioritized General Fund vehicle-related fees and taxes. Tax and Local Government Finance Division but does not include increases to Local Government Aid, County Program Aid or working family tax credit. Similarly, the Senate Taxes committee announced last week that their Omnibus Tax bill, SF 2255, chief authored by Sen. Roger Chamberlain (R-Lino Lakes), proposes $900 million in tax relief focused mainly on individual taxes, rural Minnesota and business owners. At 296 pages long, the bill also increases the working family credit, encourages online filing and conforms with the federal government level of estate tax. The House Transportation Finance Committee last week approved its omnibus bill. HF 861, chief authored by Rep. Paul Torkelson (R-Hanska). The House passed the bill on Friday off the House floor with a 76-54 vote. $6 billion in additional investments into transportation over the next 10 years by dedicating the revenue generated from the current sales tax on rental cars, leased vehicles and auto parts to transportation funding. Redirects the $10 motor vehicle registration and title fee from the Environmental Fund to roads and bridges. Authorizes $1.3 billion in trunk highway bonding for the Corridors of Commerce Program ($300 million annually) and state road and construction ($250 million annually) for the next four years. Authorizes the use of federal FAST Act funds. Uses the Minnesota Department of Transportation’s (MnDOT) unreserved fund balances for state roads. Requires MnDOT to achieve 15% efficiencies for fiscal years 2018 and 2019. $2 billion in general obligation bonds over the next 10 years for local roads and bridges as well as rail grade crossing improvements. Reduces transit funding to the Metropolitan Council. Requires CTIB to 100% fund operating costs for light rail transit. Prevents the Metropolitan Council or local unit of government from planning on a state share for capital costs for a light rail project. Prohibits local units of government from using their own funds to study or construct a light rail project without the approval of the legislature. View the complete appropriation spreadsheet for the House transportation omnibus bill. The Senate Transportation omnibus bill has been approved by the Senate. SF1060, chief authored by Sen. Scott Newman (R-Hutchinson) was passed off the Senate floor on Thursday, March 30. $3.6 billion in additional transportation investments over the next 10 years by dedicating the revenue generated from the current sales tax on rental cars and leased vehicles. Dedicate 70% of the revenue from auto parts sales tax revenue to transportation. Redirect state turnback funds to state roads and bridges. Authorize $325 million in trunk highway bonds allocating $200 million for the Corridors of Commerce program while earmarking funds for US 12 (Hennepin), Highway 212 (Carver) and Highway 14 (between Owatonna and Dodge Center). Authorizes the use of federal Fixing America’s Surface Transportation Act funds. Does not provide funding to the Metropolitan Council metro area bus service shortfall. Provides state’s 50% share of operating costs for any new light rail transit lines only if the state provides funding to help build the line. View the complete appropriation spreadsheet for the Senate transportation omnibus bill. The House and Senate Jobs Committees have spent the last few weeks constructing their omnibus bills, and both committees introduced their bills last week. SF 1937, being carried by committee chair Sen. Jeremy Miller (R-Winona), was heard by the Jobs Committee last Wednesday. Included in the Senate bill, the Minnesota Investment Fund (MIF) would receive $12.5 million in both FY 2018 and FY 2019. The Job Creation Fund (JCF) would receive $8 million per year. The bill also included $1.5 million per year for the Redevelopment Grant Program. The Senate proposal also has provisions allowing for flexibility between the programs. Miller’s bill allows for $2 million to be moved between MIF and JCF accounts by DEED to meet business demand. The language also adjusts the qualifying thresholds for businesses to be eligible for JCF funds. They are lowered for projects in greater Minnesota or for businesses with majority ownership by women, veterans, minorities or people with disabilities. EDAM testified in support of the bill last week and thanked Sen. Miller for restoring partial funding of MIF and JCF after last sessions cuts. We did urge the committee to keep looking deeper into restoring all funding. We will continue to keep in touch with Sen. Miller. In the House, HF 2209 was introduced on Thursday afternoon. Under Rep. Garofalo’s (R-Farmington) proposal, MIF would receive $12 million in FY 18 and $11 million in FY 19. The Job Creation Fund would receive $5 million in each year. No funding for the Redevelopment Grant Program was included in the bill. As in the Senate bill, some policy language that was included. JCF policy changes outlined would put restrictions on the Job Creation Fund (JCF) by limiting awards to counties where the average unemployment rate for the prior 12 months is equal to or greater than the state average unemployment rate for the same 12 months. This would eliminate communities from 31 Minnesota counties from accessing JCF funds. As you may recall, HF 1916 and SF 1522, which were introduced and supported by EDAM, Metro Cities and Minnesota Brownfields, proposed to fund the MIF at $15 million per year over the 2018-2019 biennium. These bills also proposed to fund the Redevelopment Grant program (RDG) with $10 million over the biennium, and the JCF with $12.5 million per year. Another key item that EDAM has been watching is the Border-to-Border Broadband Grant program. Under the Senate bill the program is funded at $10.25 million for both FY 18 and FY 19. The House proposal only funds the program for FY 18, at $7 million. The House took public testimony on their bill all day on Monday with about 40 organizations raising concerns. EDAM was one of those groups, and we shared our concerns with the funding levels of MIF and JCF as well as the lack of funding outlined in the bill for RDG fund. On Tuesday afternoon the committee will mark the bill up with proposed amendments and then pass it off to, most likely, Ways and Means, where they will look at the fiscal amount of the bill. From there it will head to floor for a full hearing, where it will be subject to more changes by the entire House. In the Senate, the Senate Finance Committee passed the bill out last night and is planning to send it to the floor for a full hearing as soon as Tuesday (today). From there, we will wait for the House and Senate to start the conference committee process, where they work to make the bills match up. Look for more on this in the next two weeks. In January, Gov. Mark Dayton announced a $45.8 billion budget proposal. There are several new major spending proposals in Gov. Dayton’s budget, which has been updated with the February budget forecast showing a $1.65 billion surplus. View Gov. 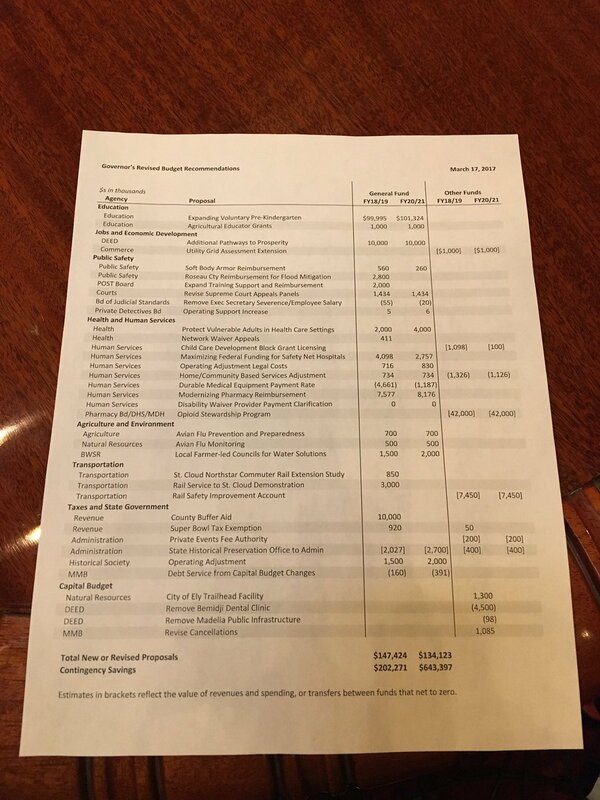 Dayton’s complete supplemental budget proposal. Two weeks ago, the Senate released budget targets that prioritize education, transportation and tax relief. Health and Human Services would receive a reduction of $335 million to its department funding over the two-year biennium, while Higher Education would see a $100 million increase. Senate leaders have also chosen to commit to a $900 million tax relief plan. The House followed suit this past Monday by releasing budget targets. Similar to the Senate, the targets prioritize transportation and tax relief. The total multi-year transportation funding numbers are still being worked out in the committee (read on for additional information). House leaders have committed to a $1.35 billion tax relief package. For education, the House is proposing a $257.8 million spending increase. The House’s proposals would spend $1 billion less than Gov. Dayton’s nearly $46 billion two-year state budget. The next steps for the final budget are handled by the Finance committees of both the House and Senate. These committees will work within the budget parameters given to them for their omnibus bills, which must complete the committee process by Friday, March 31. After each chamber passes its omnibus bill, conference committees will meet throughout April and May to negotiate the differences between the House and Senate positions. They must have a state budget in place by the end of June to avoid a possible government shutdown. A major issue at the capitol in recent years has been passing a comprehensive transportation plan into law, a feat that has not been accomplished since 2008. This week both the House and Senate Republicans announced their proposals for multi-year funding to improve the transportation system in the state. Led by Rep. Paul Torkelson (R-Hanska), chair of the Transportation Finance Committee, the House Republicans’ plan would use existing revenue in the general fund and redirect $450 million toward transportation projects across the state, citing the state’s budget surplus as a resource to fill the gap in general fund revenue. The plan would also utilize over $1 billion in bonding over several years. The plan would create a $75 surcharge on electric vehicles. The proposal would also require local governments to be responsible for cost of operation and upkeep costs for the light rail. The Senate Republicans, led by Transportation Finance Committee Chair Sen. Scott Newman (R-Hutchinson), have announced a plan that would spend $1.3 billion over two years and create dedicated transportation funding of over $500 million. Similar to the House plan, the Senate redirects roughly $400 million in sales tax on auto parts, car rentals and leases (money currently in the general fund) to fund transportation projects across the state. The Senate proposal does not include funding for any transit projects in the state. Last week, both the House and Senate Republicans announced their proposals for comprehensive tax relief. At this stage of the session these proposals are mostly an outline of initiatives to pursue, with details to be filled in as the proposals make their way through the committee process. The House proposal is a $1.35 billion plan that would emphasize an exemption for seniors from the tax on Social Security income by increasing the income tax threshold for senior citizens. The House proposal also includes a $203 million reduction in state property tax relief for businesses and a $640 tax credit for an estimated 77,500 students paying off college loans. The Senate proposal totals $900 million and would create a permanent cut to the lowest income tax rate, which Senate Republicans estimate will impact 81 percent of Minnesotans. Limited details are available on the plan, but the proposal will focus on tax relief for middle class families, senior citizens, business owners, and students. This past week, EDAM along with Metro Cities and Minnesota Brownfields continues to advocate and push for the restoration of funding to the Minnesota Investment Fund (MIF) and the Job Creation Fund (JCF) along with funding and adding additional money to the Redevelopment Grant Program. On Tuesday night, the House Jobs committee heard HF 1916 authored by Rep. Jeff Howe (R-Rockville). The bill would fund MIF at $15 million per year and JCF at $12.5 million per year over the FY 18-19 biennium along with $10 million for the Redevelopment Grant Program. Testifying on behalf of EDAM was Duane Northagen with the Wright County Economic Development Partnership. Duane discussed the impact that these programs have across the state as economic developers are working with businesses to stay, relocate or expand in Minnesota. A few questions were asked regarding the account balances and future funding of MIF and JCF. A larger discussion ensued regarding the administration of the Redevelopment Gran Program and the timing of when funds are released. No action was taken by the committee as the bill was laid over and will possibly be included as part of an omnibus bill. In an effort to keep the pressure on legislators this session regarding these three programs, a press conference was held on Wednesday afternoon with our bill two authors, two businesses that have received MIF and JCF funds and EDAM President Adam Kienberger. All five speakers shared their perspective as to why these programs need to be funded to help promote the state against competitors, how the programs have helped keep and expand a number of local businesses as well as what the return in investment has meant to the state. A copy of the press release can be found here. Along with being shared with the local and statewide media, copies were dropped off with Legislative Leadership and committee chairs. We are still asking EDAM members to make a phone call or send an e-mail to their legislators asking for their support on HF 1916 and SF 1522. Please take a few minutes and share your experiences with the programs and what they have meant to businesses and workers in the district. As the House and Senate Jobs Committee’s work to hear bills for their omnibus bills, a number of proposals regarding the Border-to-Border Broadband Grant Program were heard. As has been the case the last few legislative sessions, there is still a big disagreement on how much should be funded this biennium. Advocates from across the state made their way to the Capitol this week to testify on bills and meet with their local legislators as they discuss the importance to funding the program to help areas and regions of the state that are underserved. In the next few weeks we will get a feel for where the House and Senate fall when they release their draft omnibus bills. The legislative session is 11 weeks old, meaning it is more than halfway over. The second committee deadline passes at Midnight on Friday, March 17, which means that a policy bill must have completed the committee process in both the House and the Senate to be eligible to be passed into law. Bills that have not been passed by committee before deadline are still able to be considered in committee next year without having to be introduced, but they cannot pass into law as a standalone bill this year. Gov. Mark Dayton released his supplemental budget proposal on Friday, and it was highlighted by $100 million in additional funding for voluntary pre-Kindergarten (totaling $175 million) and an additional $200 million on the bottom line due to economic uncertainty. Look for legislative leadership to release their budget targets next week as majorities in both chambers begin to assemble their omnibus finance bills. In a letter sent to legislative leadership Gov. Dayton laid out what his principles and expectations will be for the last half of the session. In the letter he stated he would not accept an “arbitrary” 10 percent reduction to the state budget without stating specific reasons for that reduction to the state budget, saying legislators must “state specifically what [they] want state government NOT to do.” Gov. Dayton also requested agreement to set a joint conference committee budget target by Friday, April 28, which would leave more than three weeks to negotiate details of the omnibus budget bills before the final deadline to adjourn on Monday, May 22. Today the House Committee on Job Growth & Energy Affordability Policy and Finance will be hearing HF 1916 at 3pm in room 10 of the State Office Building. EDAM will be on hand to testify in support of the bill and call on the committee to fund the Minnesota Investment Fund, Job Creation Fund, and the Redevelopment Program Fund. EDAM and Metro Cities have worked together on drafting the bill and securing committee support. The language in the bill appropriates $15,000,000 a year to the Minnesota Investment fund and $12,500,000 a year to the Minnesota Job Creation Fund. The bill also makes a one-time appropriation of $10,000,000 to the Redevelopment Program for grants and loans to fund site redevelopment, which may include land acquisition and demolition costs. Over the next few weeks, we will call on members to share stories and discuss the programs with their elected officials. If you want to start connecting with them now, click here to access their contact information. On Wednesday, EDAM and Metro Cities will be hosting a joint press Conference with our two bill authors, Sen. Paul Anderson (R-Plymouth) and Rep. Jeff Howe (R-Rockville) to highlight SF 1522 and HF 1916, which support the Minnesota Investment Fund, Job Creation Fund and Redevelopment Grant Program with financial investments to these economic development programs. Along with our bill authors, program beneficiaries will attend the press conference to share their stories of what these programs have meant for their districts and communities, as well as to assist in the push to fund the programs this session. If you would like to attend and share your story and experience with these programs, please contact Nick de Julio at 651-470-7957 or nickd@ewald.com The press conference will take place at 12:30pm in the State Capitol Press Conference Room. This week was the busiest of the 2017 legislative session so far, as dozens of committees heard hundreds of bills in order to meet the first committee deadline. Committee agendas have been jam-packed all week with as many bills as possible (the House Transportation and Regional Governance Policy committee heard over 20 bills in one committee hearing) to pass them either to the next committee stop or to the General Register (House) or General Orders (Senate), to then be voted on by the full chamber. In addition, dozens of advocacy groups have been active at the capitol promoting or fighting legislation affecting their groups. It is the busiest the newly renovated capitol has been yet this year. For a bill to become law, it must have made it through the committee process in at least one of the chambers by the end of the day last Friday, March 10. The second committee deadline is this Friday, March 17. A bill that met the first deadline must pass though the committee process of the other chamber by that date to still be eligible to be voted on by the full body of either the House of Representatives or the Senate. Finally, all finance bills must complete the committee process by Friday, March 31 to still be eligible to be voted on by either chamber’s full body. Check the combined legislative calendar to stay up to date on the activities at the capitol. Check the streaming schedule in the House and the Senate to view any committee hearing of interest. Sign up for Session Daily updates delivered by the House Public Information Office. For the eighth consecutive time over the past four years, Minnesota has a projected budget surplus. Estimates in November 2016 had the state budget surplus at $1.4 billion over the next two years, but last week the office of Minnesota Management and Budget (MMB) announced the surplus has risen to $1.65 billion. MMB commissioner Myron Frans stated that the increased revenue is due to higher-than-expected returns on sales tax, and a shrinking unemployment rate. View the MMB’s budget forecast presentation. While this is positive fiscal news for the state, both legislators and Gov. Mark Dayton expressed caution when asked about what they intend to do with the additional funds. Speaker of the House Kurt Daudt (R-Crown) and Senate Majority Leader Paul Gazelka (R-Nisswa) both stated they will prioritize tax relief, K-12 education, and roads and bridges in their budgets. Gov. Dayton released a budget proposal in January, so he will take steps to revise that proposal and release a supplemental version in the coming days. In the upcoming weeks, Gov. Dayton will provide an updated 2017-2018 budget proposal utilizing the new financial information. House and Senate Republicans will release their budget targets for each of their respective finance committees, which will determine how much of the state budget each area receives in the final budget. The budget must be in place by July to avoid a state government shutdown. Last week the Senate Jobs and Economic Growth Finance and Policy Committee heard testimony on two bills that would both appropriate funds to the Border-to-Border Broadband grant program. SF 980 authored by Sen. Torrey Westrom (R-Elbow Lake) appropriates $35 million in fiscal year 2018 from the general fund for the grant program. The bill also specifies that no more than $5 million may be for grants to underserved areas. The bill also specifies that grants for projects in underserved areas may fund no more than 50 percent of a project cost. Requires grants for projects in un-served areas to have a 25 percent match. Current law allows only up to 50 percent of the project cost for all projects. Lowers the maximum grant allowed from $5 million to $3 million. SF 980 does not yet have a companion in the House. SF 234 authored by Sen. Erik Simonson (DFL-Duluth) appropriates $100 million in fiscal year 2018 from the general fund for the grant program. Simonson’s bill does not address any policy changes regarding underserved or un-served areas. In the House, HF 841 is the companion. Support on both bills came from a number of groups and people ranging from trade associations to local government. Both bills were held over and will potentially become part of a larger omnibus bill once the committee receives its budget target. As session marches on, more work will be done on the House and Senate floors and less work will be done in the committee rooms. At this point there have been 1,735 bills introduced in the Senate and 2,065 bills in the House. The House and Senate will be moving at break-neck speed in the month of March to pass bills through the committee process. Keep up-to-date on the work being done at the capitol on the combined legislative calendar. The first committee deadline is only four days away, on Friday, March 10. The second deadline will be on Friday, March 17, with the final deadline coming on Friday, March 31. For a policy bill to become law it must pass out of at least one of the chambers by March 10, and then subsequently be passed by the other chamber by March 17. Any bill that has a financial cost may be passed at any point up to the final deadline on March 31. The House Public Information office has developed a brief video detailing the committee deadline process. To date there have been four bills have been passed by both chambers and signed into law. Gov. Dayton has a legislative tracker that shows all bills signed into law. So far, there has been a bill creating a Rural Finance Authority, health insurance premium relief, a property tax provision change and a federal tax conformity measure. The bill authorizing Sunday liquor sales is now on deck to be the fifth bill signed into law. Legislation written with input from EDAM members was introduced in the Senate on Monday! SF1522, authored by Senator Paul Anderson (R-Plymouth), has been referred to the Senate Committee on Jobs and Economic Growth Policy and Finance, and a companion bill will soon be introduced in the House. This bill would provide $15 million for the Minnesota Investment Fund (MIF), $12.5 million for the Jobs Creation Fund (JCF) and $10 million for the Redevelopment program. Download our project sheet of key projects that have received MIF and JCF funding. Another bill was also introduced to boost funds to MIF and JCF. SF969, authored by Senator Little (DFL-Lakeville) and its companion HF1626 authored by Representative Petersburg (R-Owatonna) would provide similar levels of funding for MIF and JCF but does not include funding for the Redevelopment program. The continuing quest for better, faster Internet connections state-wide took a step forward at the State Capitol this week, with a pair of bills being heard in the Senate related to the broadband grant program. The bills – SF 980 and SF 235 – would modify and provide funds for the grant program, which is designed to provide better broadband to under-served areas of Greater Minnesota. Members of the Senate Jobs and Economic Growth Finance and Policy Committee heard testimony on the bills from a number of individuals representing various interests. Among the testimony heard by committee members were stories of small businesses in rural Minnesota losing economic opportunity for lack of high-speed broadband coverage, and parents driving their children to the parking lot of fast food restaurants in the evening, so that the kids could use high speed Internet connections to complete and send their homework. One official from a rural Minnesota community said that high speed broadband is a utility as vital as electricity and running water for modern life in the state. Both pieces of legislation were laid over for possible inclusion in an omnibus bill. Last week more than 50 economic developers from across the state came together in St. Paul for the sixth annual Economic Development Day at the Capitol. They gathered to share ideas and promote their thoughts regarding the direction of economic development in Minnesota. It was a full day of information and activity, including sharing policy platforms from five different organizations, discussing current legislation and hearing from a number of speakers. Guests included Sen. Jeremy Miller (R-Winona), chair of the Senate Jobs and Economic Growth Finance and Policy Committee, Speaker of the House Rep. Kurt Daudt (R-Crown), DFL House Minority Leader Rep. Melissa Hortman (DFL-Brooklyn Park) and DEED Commissioner Shawntera Hardy. Following our guest speakers, attendees met with their legislators to share thoughts and ideas, and to offer themselves as a resource on economic development questions. Along with sharing policy platforms, at the forefront of the discussion and requests were a big push for funding for the Minnesota Investment Fund (MIF), Job Creation Fund (JCF) and Redevelopment Grant Funds. EDAM, along with other stakeholders, has been working on a bill that will fund MIF, JCF and Redevelopment Grants back to full levels this session. While our bill has not yet been introduced, members spent the day setting the stage for a full push in the coming weeks. In addition to the great education and advocacy in the morning, EDAM members took the opportunity in the afternoon to testify before the Senate Jobs and Economic Development Finance and Policy Committee on SF784 which would increase funding levels of JCF and MIF. EDAM Board Member and Chair of the EDAM Government Relations Committee Matt Brown testified on behalf of EDAM, sharing stories of how he and other EDAM members have used both programs to retain and attract business in Minnesota. Brown and others shared stories of what these programs have meant to their cities and counties. Reaction from committee members was positive as there was strong support for funding both of these programs. While EDAM is seeking more, we will use this early support as a start and push for MIF, JCF and Redevelopment Funding this session. If you were unable to make it this year, we hope you will think of joining us in the future. We still need your voices of support this session on a number of issues. Look for future action alerts and calls from us over the next few weeks.